Born and raised in the US state of Georgia, Redding quit school at age 15 to support his family, working with Little Richard's backing band, the Upsetters, and performing at talent shows for prize money. In 1958, he joined Johnny Jenkins's band, the Pinetoppers, with whom he toured the Southern states as a singer and driver. An unscheduled appearance on a Stax recording session led to a contract and his first single, "These Arms of Mine," in 1962. Stax released Redding's debut album, Pain in My Heart, two years later. Initially popular mainly with African-Americans, Redding later reached a wider American pop music audience. Along with his group, he first played small gigs in the American South. He later performed at the popular Los Angeles night club Whisky a Go Go and toured Europe, performing in London, Paris and other major cities. He also performed at the Monterey Pop Festival in 1967. Shortly before his death in a plane crash, Redding wrote and recorded his iconic "(Sittin' on) The Dock of the Bay" with Steve Cropper. The song became the first posthumous number-one record on both the Billboard Hot 100 and R&B charts. The album The Dock of the Bay was the first posthumous album to reach number one on the UK Albums Chart. Redding's premature death devastated Stax. Already on the verge of bankruptcy, the label soon discovered that Atlantic Records owned the rights to his entire song catalog. Redding was born in Dawson, Georgia, the fourth of six children, and the first son, of Otis Redding, Sr., and Fannie Mae Redding. Redding senior was a sharecropper and then worked at Robins Air Force Base, near Macon, and occasionally preached in local churches. When Otis was three the family moved to Tindall Heights, a predominantly African-American public housing project in Macon. At an early age, Redding sang in the Vineville Baptist Church choir and learned guitar and piano. From age 10, he took drum and singing lessons. At Ballard-Hudson High School, he sang in the school band. Every Sunday he earned $6 by performing gospel songs for Macon radio station WIBB. His passion was singing, and he often cited Little Richard and Sam Cooke as influences. Redding said that he "would not be here" without Little Richard and that he "entered the music business because of Richard – he is my inspiration. I used to sing like Little Richard, his Rock 'n' Roll stuff... My present music has a lot of him in it." At age 15, Redding left school to help financially support his family; his father had contracted tuberculosis and was often hospitalized, leaving his mother as the family's primary income earner. He worked as a well digger, as a filling (gas) station attendant and occasionally as a musician. Pianist Gladys Williams, a locally well-known musician in Macon and another who inspired Redding, often performed at the Hillview Springs Social Club, and Redding sometimes played piano with her band there. Williams hosted Sunday talent shows, which Redding attended with two friends, singers Little Willie Jones and Eddie Ross. Redding's breakthrough came in 1958 on disc jockey Hamp Swain's "The Teenage Party," a talent contest at the local Roxy and Douglass Theatres. Johnny Jenkins, a locally prominent guitarist, was in the audience and, finding Redding's backing band lacking in musical skills, offered to accompany him. Redding sang Little Richard's "Heebie Jeebies." The combination enabled Redding to win Swain's talent contest for fifteen consecutive weeks; the cash prize was $5. Jenkins later worked as lead guitarist and played with Redding during several later gigs. Redding was soon invited to replace Willie Jones as frontman of Pat T. Cake and the Mighty Panthers, featuring Johnny Jenkins. Redding was then hired by the Upsetters when Little Richard abandoned rock and roll in favor of gospel music. Redding was well paid, making about $25 per gig, but did not stay long. At age 19, Redding met 15-year-old Zelma Atwood at "The Teenage Party." She gave birth to their son Dexter in the summer of 1960 and married Redding in August 1961. In mid-1960, Otis moved to Los Angeles with his sister, Deborah, where he wrote his first songs, including "She's Allright," "Tuff Enuff," "I'm Gettin' Hip" and "Gamma Lamma" (which he recorded as a single in 1962, under the title "Shout Bamalama"). "These Arms of Mine" and other songs from the 1962–1963 sessions were included on Redding's debut album, Pain in My Heart. "That's What My Heart Needs" and "Mary's Little Lamb" were recorded in June 1963. The latter is the only Redding track with both background singing and brass. It became his worst-selling single. The title track, recorded in September 1963, sparked copyright issues, as it sounded like Irma Thomas's "Ruler of My Heart". Despite this, Pain in My Heart was released on January 1, 1964, and peaked at number 20 on the R&B chart and at number 85 on the Billboard Hot 100. In November 1963, Redding, accompanied by his brother Rodgers and an associate, former boxer Sylvester Huckaby (a childhood friend of Redding's), traveled to New York to perform at the Apollo Theater for the recording of a live album for Atlantic Records. Redding and his band were paid $400 per week, but had to pay $450 for sheet music for the house band, led by King Curtis, which left them in financial difficulty. The trio asked Walden for money. Huckaby's description of their circumstances living in the "big old raggedy" Hotel Theresa is quoted by Peter Guralnick in his book Sweet Soul Music. He noted meeting Muhammad Ali and other celebrities. Ben E. King, who was the headliner at the Apollo when Redding performed there, gave him $100 when he learned about Redding's financial situation. The resulting album featured King, the Coasters, Doris Troy, Rufus Thomas, the Falcons and Redding. Around this time Walden and Rodgers were drafted by the army; Walden's younger brother Alan joined Redding on tour, while Earl "Speedo" Simms replaced Rodgers as Redding's road manager. Most of Redding's songs after "Security", from his first album, had a slow tempo. Disc jockey A. C. Moohah Williams accordingly labeled him "Mr. Pitiful", and subsequently Cropper and Redding wrote the eponymous song. That and top 100 singles "Chained and Bound", "Come to Me" and "That's How Strong My Love Is" were included on Redding's second studio album, The Great Otis Redding Sings Soul Ballads, released in March 1965. Jenkins began working independently from the group out of fear Galkin, Walden and Cropper would plagiarize his playing style, and so Cropper became Redding's leading guitarist. Around 1965, Redding co-wrote "I've Been Loving You Too Long" with Jerry Butler, the lead singer of the Impressions. That summer, Redding and the studio crew arranged new songs for his next album. Ten of the eleven songs were written in a 24-hour period on July 9 and 10 in Memphis. Two songs, "Ole Man Trouble" and "Respect", had been finished earlier, during the Otis Blue session. "Respect" and "I've Been Loving You" were later recut in stereo. The album, entitled Otis Blue: Otis Redding Sings Soul, was released in September 1965. Redding also released his much-loved cover of "A Change Is Gonna Come" in 1965. Redding's success allowed him to buy a 300-acre (1.2 km2) ranch in Georgia, which he called the "Big O Ranch." Stax was also doing well. Walden signed more musicians, including Percy Sledge, Johnnie Taylor, Clarence Carter and Eddie Floyd, and together with Redding they founded two production companies. "Jotis Records" (derived from Joe Galkin and Otis) released four recordings, two by Arthur Conley and one by Billy Young and Loretta Williams. The other was named Redwal Music (derived from Redding and Walden), which was shut down shortly after its creation. Since Afro-Americans still formed the majority of fans, Redding chose to perform at Whisky a Go Go on the Sunset Strip in Los Angeles. Redding was one of the first soul artists to perform for rock audiences in the western United States. His performance received critical acclaim, including positive press in the Los Angeles Times, and he penetrated mainstream popular culture. Bob Dylan attended the performance and offered Redding an altered version of one of his songs, "Just Like a Woman". The spring of 1966 marked the first time that Stax booked concerts for its artists. The majority of the group arrived in London on March 13, but Redding had flown in days earlier for interviews, such as at "The Eamonn Andrews Show". When the crew arrived in London, the Beatles sent a limousine to pick them up. Booking agent Bill Graham proposed that Redding play at the Fillmore Auditorium in late 1966. The gig was commercially and critically successful, paying Redding around $800 to $1000 a night. It prompted Graham to remark afterwards, "That was the best gig I ever put on in my entire life." Redding began touring Europe six months later. In 1967, Redding performed at the influential Monterey Pop Festival as the closing act on Saturday night, the second day of the festival. He was invited through the efforts of promoter Jerry Wexler. Until that point, Redding was still performing mainly for black audiences. His act, which included his own song "Respect" and a version of the Rolling Stones' "Satisfaction", was well received by the audience. Redding and his backing band (Booker T. & the M.G. 's with the Mar-Keys horn section) opened with Cooke's "Shake", after which he delivered an impulsive speech, asking the audience if they were the "love crowd" and looking for a big response. The ballad "I've Been Loving You" followed. The last song was "Try a Little Tenderness", including an additional chorus. "I got to go, y'all, I don't wanna go", said Redding and left the stage of his last major concert. According to Booker T. Jones, "I think we did one of our best shows, Otis and the MG's. That we were included in that was also something of a phenomenon. That we were there? With those people? They were accepting us and that was one of the things that really moved Otis. He was happy to be included and it brought him a new audience. It was greatly expanded in Monterey." According to Sweet Soul Music, musicians such as Brian Jones and Jimi Hendrix were captivated by his performance; Robert Christgau wrote in Esquire, "The Love Crowd screamed one's mind to the heavens." By 1967 the band was traveling to performances in Redding's Beechcraft H18 aeroplane. On December 9, 1967, they appeared on the Upbeat television show produced in Cleveland. They played three concerts in two nights at a club called Leo's Casino. After a phone call with his wife and children, Redding's next stop was Madison, Wisconsin; the next day they were to play at the Factory nightclub, near the University of Wisconsin. Aretha Franklin stated, "I heard it on the TV. My sister Caroline and I stopped everything and stayed glued to the TV and radio. It was a tragedy. Shocking." Redding's body was recovered the next day when the lake was searched. The family postponed the funeral from December 15 to December 18 so that more could attend. The service took place at the City Auditorium in Macon. More than 4,500 people came to the funeral, overflowing the 3,000-seat hall, although many did not know who he was. Johnny Jenkins and Isaac Hayes did not attend, fearing their reaction would be worse than Zelma Redding's. Redding was entombed at his ranch in Round Oak, about 20 miles (32 km) north of Macon. Jerry Wexler delivered the eulogy. Redding died just three days after recording "The Dock of the Bay". He was survived by Zelma and three children, Otis III, Dexter and Karla. Otis, Dexter and cousin Mark Lockett later founded the Reddings, a band managed by Zelma. She also maintained or worked at the janitorial service Maids Over Macon, several nightclubs and booking agencies. On November 8, 1997, a memorial plaque was placed on the lakeside deck of the Madison convention center, Monona Terrace. In September 2007, the first official DVD anthology of Redding's live performances was released by Concord Music Group, then owners of the Stax catalog. Dreams to Remember: The Legacy of Otis Redding featured 16 full-length performances and 40 minutes of new interviews documenting his life and career. On May 18, 2010, Stax Records released a two-disc recording of three complete sets from his Whisky a Go Go date in April 1966. His hallmark was his raw voice and ability to convey strong emotion. Richie Unterberger of Allmusic noted his "hoarse, gritty vocals, brassy arrangements, an emotional way with both party tunes and aching ballads." In the book Rock and Roll: An Introduction, authors Michael Campbell and James Brody suggested that "Redding's singing calls to mind a fervent black preacher. Especially in up-tempo numbers, his singing is more than impassioned speech but less than singing with precise pitch." According to the book, "Redding finds a rough midpoint between impassioned oratory and conventional singing. His delivery overflows with emotion" in his song "I Can't Turn You Loose". Booker T. Jones described Redding's singing as energetic and emotional, but said that his vocal range was limited, reaching neither low nor high notes. Peter Buckley, in The Rough Guide to Rock, describes his "gruff voice, which combined Sam Cooke's phrasing with a brawnier delivery" and later suggested he "could testify like a hell-bent preacher, croon like a tender lover or get down and dirty with a bluesy yawp". In his early career Redding mostly covered songs from popular artists, such as Richard, Cooke and Solomon Burke. Around the mid-1960s he began writing his own songs—always taking along his cheap red acoustic guitar—and sometimes asked for Stax members' opinion of his lyrics. He often worked on lyrics with other musicians, such as Simms, Rodgers, Huckaby, Phil Walden and Cropper. During his recovery from his throat operation, Redding wrote about 30 songs in two weeks. Redding was the sole copyright holder on all of his songs. In "(Sittin' on) The Dock of the Bay" he abandoned familiar romantic themes for "sad, wistful introspections, amplified by unforgettable descending guitar riffs by Cropper". The website of the Songwriters Hall of Fame noted that the song "was a kind of brooding, dark voicing of despair, ('I've got nothin' to live for/Look like nothin' gonna come my way')" although "his music, in general, was exultant and joyful." According to journalist Ruth Robinson, author of the liner notes for the 1993 box set, "It is currently a revisionist theory to equate soul with the darker side of man's musical expression, blues. That fanner of the flame of 'Trouble's got a hold on me' music, might well be the father of the form if it is, the glorified exaltation found in church on any Sunday morning is its mother." The Songwriters Hall of Fame website adds that "glorified exaltation indeed was an apt description of Otis Redding's songwriting and singing style." Booker T. Jones compared Redding with Leonard Bernstein, stating, "He was the same type person. He was a leader. He'd just lead with his arms and his body and his fingers." Artists from many genres have named Redding as a musical influence. George Harrison called "Respect" an inspiration for "Drive My Car". The Rolling Stones also mentioned Redding as a major influence. Other artists influenced by Redding include Led Zeppelin, Grateful Dead, Lynyrd Skynyrd, the Doors, and virtually every soul and R&B musician from the early years, such as Al Green, Etta James, William Bell, Aretha Franklin, Marvin Gaye and Conley. Musicians have covered or mixed his songs, notably Kanye West and Jay-Z in their Grammy Award–winning song "Otis". Janis Joplin was influenced by his singing style, according to Sam Andrew, a guitarist in her band Big Brother and the Holding Company. She stated that she learned "to push a song instead of just sliding over it" after hearing Redding. The Rock and Roll Hall of Fame inducted Redding in 1989, declaring his name to be "synonymous with the term soul, music that arose out of the black experience in America through the transmutation of gospel and rhythm and blues into a form of funky, secular testifying." Readers of the British music newspaper Melody Maker voted him the top vocalist of 1967, superseding Elvis Presley, who had topped the list for the prior 10 years. In 1988, he was inducted into the Georgia Music Hall of Fame. Five years later, the United States Post Office issued a 29-cent commemorative postage stamp in his honor. Redding was inducted into the Songwriters Hall of Fame in 1994, and in 1999 he received the Grammy Lifetime Achievement Award. The Rock and Roll Hall of Fame included three Redding recordings, "Shake", "(Sittin' on) The Dock of the Bay", and "Try a Little Tenderness," on its list of "The 500 Songs That Shaped Rock and Roll." American music magazine Rolling Stone ranked Redding at number 21 on their list of the "100 Greatest Artists of All Time" and eighth on their list of the "100 Greatest Singers of All Time". Q ranked Redding fourth among "100 Greatest Singers", after only Frank Sinatra, Franklin and Presley. 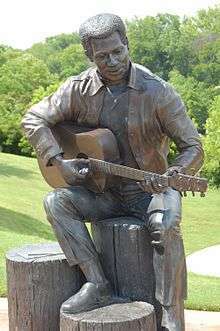 In 2002, the city of Macon honored its native son by unveiling a memorial statue (32°50′19.05″N 83°37′17.30″W﻿ / ﻿32.8386250°N 83.6214722°W﻿ / 32.8386250; -83.6214722) in the city's Gateway Park. The park is next to the Otis Redding Memorial Bridge, which crosses the Ocmulgee River. The Otis Redding Memorial Library is also housed in the city. The Rhythm and Blues Foundation named Redding as the recipient of its 2006 Pioneer Award. Billboard awarded Redding the "Otis Redding Excellence Award" the same year. A year later he was inducted into the Hollywood's Rockwalk in California. On August 17, 2013, in Cleveland, Ohio, the city where he did his last show at Leo's Casino, Redding was inducted into the inaugural class of the Official Rhythm & Blues Music Hall of Fame at Cleveland State University. 1 2 Labrie 1968, p. 38. ↑ Phelps 1997, p. 179. 1 2 3 Guralnick 1999, pp. 164–167. 1 2 3 4 Bowman 1997, p. 40. 1 2 Brown 2001, p. 10. ↑ White 2003, p. 229. ↑ Gulla 2007, pp. 395–396. ↑ Brown 2001, p. 11. 1 2 Gulla 2007, pp. 397–399. ↑ Guralnick 1999, pp. 167–168. ↑ Guralnick 1999, p. 166. ↑ Guralnick 1999, p. 168. ↑ Gulla 2007, p. 398. 1 2 3 4 Gulla 2007, pp. 401–408. ↑ Reed, William (April 26, 2012). "The Howard Theatre: "The People's Place"". Washington Informer. Retrieved May 14, 2012. 1 2 Gulla 2007, pp. 400–401. ↑ Guralnick 1999, p. 159. ↑ Brown 2001, p. 16. 1 2 "Otis Redding". Stax Museum of American Soul Music. Retrieved September 26, 2011. ↑ Freeman 2002, p. 77. 1 2 3 Guralnick 1999, p. 175. ↑ Gulla 2007, p. 396. ↑ Brown 2001, pp. 39–40. ↑ Guralnick 1999, pp. 175–176. ↑ Guralnick 1999, pp. 177–179. ↑ Guralnick 1999, p. 183. 1 2 "Otis Redding – Awards". Allmusic. Rovi Corporation. Retrieved June 11, 2012. ↑ Bowman 1997, p. 57. ↑ Guralnick 1999, pp. 178–180. ↑ Mendelsohn, Jason; Klinger, Eric (December 9, 2011). "Counterbalance No. 61: 'Otis Blue/Otis Redding Sings Soul'". Popmatters. SPIN Music Group. Retrieved November 21, 2012. 1 2 Bowman 1997, p. 105. ↑ "The RS 500 Greatest Songs of All Time". Rolling Stone. Wenner Media. December 9, 2004. Archived from the original on June 25, 2008. Retrieved February 14, 2012. 1 2 3 4 5 "Biography". Otis Redding Official Website. Retrieved August 3, 2011. 1 2 3 Bowman 1997, p. 59. 1 2 Inglis 2006, pp. 28–38. ↑ Bowman 1997, pp. 105–107. 1 2 3 4 Gulla 2007, pp. 408–410. ↑ "Complete & Unbelievable: The Otis Redding Dictionary of Soul". Allmusic. Rovi Corporation. Retrieved August 17, 2011. 1 2 Bowman 1997, p. 117. ↑ Brown 2001, pp. 116–117. ↑ Brown 2001, p. 117. ↑ Graham & Greenfield 2004, p. 173. ↑ Bowman 1997, p. 103. 1 2 3 Bowman 1997, pp. 110–111. ↑ Guralnick 1999, pp. 379–380. ↑ Comaratta, Len (October 3, 2010). "Rock History 101: Otis Redding at the Monterey Pop Festival". Consequence of Sound. Retrieved November 15, 2011. ↑ Echols 2000, p. 164. ↑ Inglis 2006, pp. 34–37. ↑ Brown 2001, p. 2. ↑ Guralnick 1999, p. 387. 1 2 3 4 Gulla 2007, pp. 411–413. ↑ Richie Unterberger. "Sweet Soul Music". Rovi Corporation. Allmusic. Retrieved February 26, 2013. 1 2 Jet 1967, p. 55. ↑ Everitt 2004, p. 53. ↑ Guralnick 1999, pp. 388–391. ↑ Bowman 1997, pp. 132, 391. 1 2 Talevski 2006, p. 540. ↑ "Leo's Casino". The Encyclopedia of Cleveland History. Case Western Reserve University. May 23, 2001. Retrieved January 1, 2010. ↑ Knutsen, Kristian (October 12, 2007). "Otis Redding at The Factory: One night only in Madison". The Daily Page. Isthmus Publishing Company, Inc. Retrieved October 15, 2011. ↑ According to the historical marker as seen here. Fraser had had a mechanic check the plane for possible issues. ↑ Brown 2001, p. 137. ↑ "CHI68A0053". National Transportation Safety Board. Retrieved July 11, 2016. ↑ Brown 2001, p. 140. 1 2 3 Jet 1967, p. 58. ↑ Jet 1967, p. 52, 63. ↑ "Body of Singer Recovered from Crashed Plane". Bridgeport Telegram. Associated Press. 12 December 1967. Retrieved August 20, 2011. ↑ Guralnick 1999, pp. 395–396. ↑ Sime, John H. (June 12, 2007). "Otis Redding Funeral". Sime Funeral Home. Retrieved November 24, 2011. ↑ Jet 1967, p. 60. 1 2 Jet 1967, p. 62. ↑ Jet 1985, p. 64. ↑ Jet 1987, pp. 17–18. ↑ Foley, Ryan J (December 3, 2007). "Otis Redding remembered". Cincinnati.com. Retrieved May 14, 2012. ↑ Lichter-Marck, Rose (March 25, 2011). "The undying soul of Otis". The Daily Holdings, Inc. Retrieved May 13, 2011. 1 2 Otfinoski 2003, p. 194. 1 2 3 "Honors". Otis Redding Official Website. Retrieved October 13, 2011. ↑ "1968 Top 40 Official UK Albums Archive 22nd June 1968". London: The Official Charts Company. 2010. Retrieved October 19, 2011. 1 2 3 Bowman 1997, pp. 138–142. ↑ "Dreams To Remember: The Legacy of Otis Redding (2007)". Amazon.com, Inc. Retrieved April 13, 2011. ↑ Jurek, Thom. "Live on the Sunset Strip". Allmusic. Rovi Corporation. Retrieved February 14, 2012. ↑ Bowman 1997, p. 107. 1 2 Guralnick 1999, p. 390. ↑ Gulla 2007, p. 397. 1 2 3 4 Guralnick 1999, p. 182. 1 2 Labrie 1968, p. 40. ↑ Guralnick 1999, p. 381. ↑ Jet 1967, pp. 61–62. ↑ Gulla 2007, p. 412. ↑ Gulla 2007, p. xxi. ↑ "Otis Redding". Rolling Stone. Wenner Media. Retrieved February 16, 2012. ↑ Unterberger, Richie. 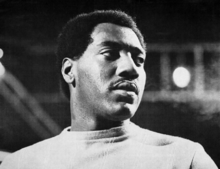 "Allmusic – Otis Redding – Biography". Allmusic. Rovi Corporation. Retrieved December 29, 2011. 1 2 Campbell & Brody 2007, pp. 189–191. 1 2 "8) Otis Redding". Rolling Stone. Wenner Media. Archived from the original on June 25, 2011. Retrieved May 6, 2011. 1 2 Buckley 2003, p. 858. ↑ Guralnick 1999, pp. 176–177. 1 2 3 Guralnick 1999, p. 161. ↑ Guralnick 1999, p. 184. ↑ Unterberger 1999, p. 224. 1 2 "Otis Redding". Songwriters Hall of Fame. Retrieved May 6, 2011. ↑ Bowman 1997, pp. 103–104. ↑ Appiah 2004, p. 146. ↑ P. Browne & R. Browne 2001, p. 672. ↑ Ripani 2006, p. 85. 1 2 "Otis Redding – Britannica Online Encyclopedia". library.eb.co.uk. Retrieved October 10, 2011. 1 2 Stanton 2003, p. 206. 1 2 Guralnick 1999, pp. 161–162. ↑ Inglis 2006, pp. 34–35. ↑ MacDonald 2005, p. 166. ↑ Buckley 2003, p. 171. ↑ Rollin 1967, p. 207. ↑ Palmer & DeCurtis 2009, p. 241. ↑ Bream 2010, p. 227. 1 2 3 "In Popular Culture". Otis Redding Official Website. Retrieved July 2, 2011. ↑ P. Browne & R. Browne 2001, p. 502. 1 2 Gulla 2007, p. 414. ↑ "Music: Otis Redding". Janis Joplin Official Website. Retrieved August 3, 2011. ↑ "Otis Redding Biography". The Rock and Roll Hall of Fame and Museum, Inc. Retrieved July 24, 2011. ↑ Guralnick 1999, p. 389. ↑ "African-American Subjects on United States Postage Stamps" (PDF). United States Post Office. Retrieved May 6, 2011. ↑ "Lifetime Achievement Award". The Recording Academy. Retrieved May 6, 2011. ↑ "500 Songs That Shaped Rock and Roll". HighBeam Research, LLC. Retrieved May 6, 2011. ↑ Steve Cropper. "Otis Redding". Rolling Stone. Wenner Media. Archived from the original on June 20, 2011. Retrieved August 20, 2011. ↑ "Q – 100 Greatest Singers". Rocklistsmusic.com. Retrieved November 19, 2011. ↑ "Greatest Albums of All Time". NME. IPC Media: 29. February 10, 1993. ISSN 0028-6362. Retrieved October 6, 2011. ↑ Christgau, Robert (May 2008). "Otis Redding: Otis Blue". Blender. New York. Retrieved May 30, 2013. ↑ Christgau, Robert (September 1, 1987). "Consumer Guide". The Village Voice. New York. Retrieved May 30, 2013. ↑ "African American Heritage". Macon-Bibb County Convention & Visitors Bureau. Retrieved October 13, 2011. ↑ "Pioneer Awards". Rhythm & Blues Foundation. Retrieved May 14, 2011. Gilliland, John (1969). "The Soul Reformation: Phase Three, Soul Music at the Summit" (audio). Pop Chronicles. Digital.library.unt.edu. Delehant, Jim (2004). David Brackett, ed. The Pop, Rock, and Soul Reader: Histories and Debates. New York: Oxford University Press. "The Blues Changes from Day to Day" "Otis Redding Interview". OCLC 628872571.